I remember learning about the pentatonic scale and applying it to solo over backing tracks; these first experiences are still in the back of my mind and they still feel like magic. But in most guitarists lives there comes a point (I experienced this too in my early guitar playing life) where all of the sudden you stop progressing with your guitar playing. In this article we’re going to look at the reasons to why this happens and how we can change the situation so that you start to make progress again fast and make your blues guitar playing sound very melodic. Are You Stuck In Blues Guitar Kindergarden Class? Fact is that more then 95% of all beginner to intermediate students exclusively use the pentatonic scale to solo over a dominant blues progression. To make matters worse, they will use this scale over ALL of the chords, which makes their blues guitar solos sound amateurish. This large group of guitar students doesn’t have a clue what to do to improve their soloing. These guitar students are trying to sound the same as their blues guitar hero's, but they have no clue that they are in fact using the wrong scales/notes. It's like trying to sound as someone, but they don't know they're speaking another language. Sounds familiar? I know, I’ve been there years ago when I wanted to learn to play great blues guitar myself and I’ve seen this happen over and over with blues guitar students. Guitarists from all over the world fall into the trap of playing the minor pentatonic scale over all chords in a blues, which is a great way to start your improvisation adventure out with, but often times people get stuck in this stage of their progress. In order to escape the tyranny of the minor pentatonic box position, there are several “escape routes” you can learn. Chord Tone Targetting is one really powerfull way to escape this box position. 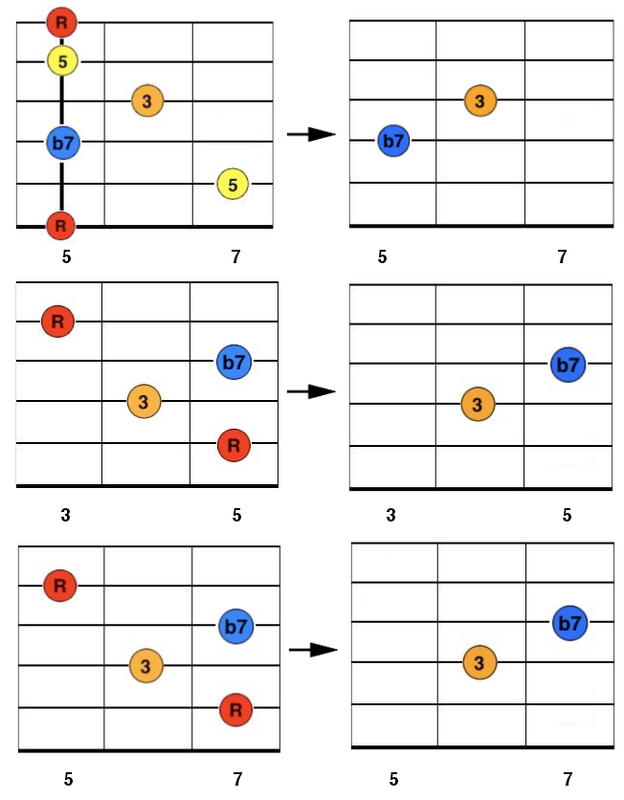 Great guitarists play different things (scales / arpeggio's) over each chord, beginners and intermediate blues guitarists play one scale over all chords. Learning about chord tone targetting is a great way to get some momentum into your progress again. While the term “Chord Tone Targetting” might sound very intellectual or advanced, the practical application will prove otherwise. While it is true that you need a different way of thinking to escape the box position cage, you will experience that this new way of thinking in fact is pretty simple when you practice with this for a while. What you need in order to advance your blues guitar soloing is a reference to outline the chords you’re playing over. Instead of landing on one note, we’re going to land on a doublestop (which means two adjacent strings are played together). 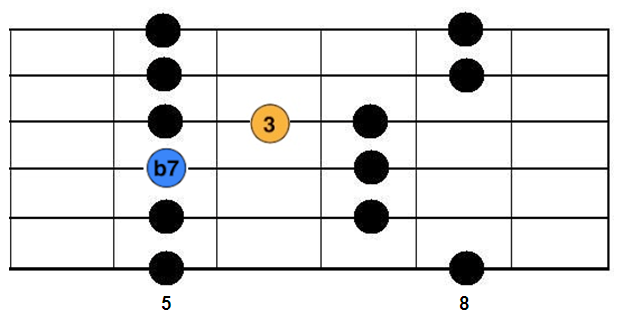 Since these doublestops are derived from the chords we are playing over in a standard 12 bar blues, this will make your playing sound very melodically, so that over each chord you will play the most important tones at the best possible time (which, can lead to a neat goose bumps effect and a real revelation in your own knowledge and the perception of music theory). When you look closely at the doublestops below (at the right side), you’ll see that they correspond with the notes of the chords we are using (at the left side) to play a 12 bar blues in A. The first chord at the left side is the A7 chord. Under the A7 chord you’ll see the D7 chord and under the D7 you’ll get the E7 chord. 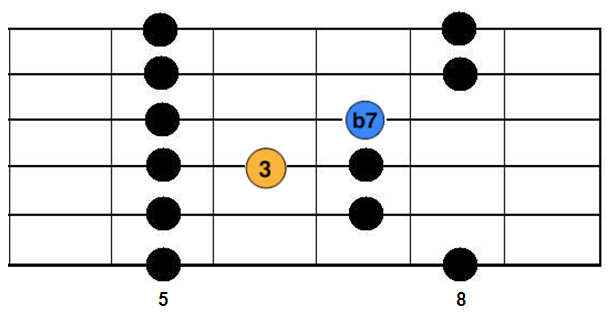 As you can see the A7, D7 and E7 chords are exactly the chords that we used to substract the doublestops from. 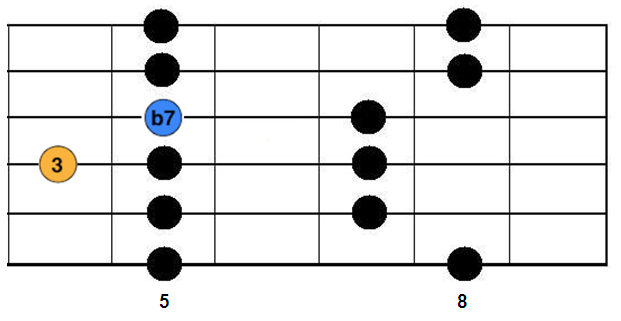 From each chord we substracted the two most important tones; the major third (3) and the flat seven (b7). As you will see in a moment, when we use these two notes at the right time, they can have a very deep impact in your playing. With my students, I refer to these breaking points as “escape routes”. For example, in the scale diagram below you see that we use the A minor pentatonic scale (the box position that we referred to throughout this article), with the added important two notes from the A7 chord. Thus, we call this “Escape Route Over The A7 Chord”. For now, you don’t need to try out anything, I’ll give you a great an easy to implement exercise and lick in a moment! As you see in the next diagram, here we use the minor pentatonic box position again as our main starting point, but add the two important notes from the D7 chord. And here we are doing the same with the two important notes from the E7 chord. Let’s look at some real-life examples of how this chord tone targetting gets used. Below you find an example lick that would fit neatly over the D7 chord. Take note of the two landing notes of this lick (the two last notes). We are playing the F# note together with the C note (let ring). Can you see how these two notes relate to the D7 chord? If you’re having trouble visualising the connection between these two notes and the chord we are playing them over, take a look to the diagrams below. As you can see we’ve extracted the two most important tones of the chord (the major third and the flat seventh) and used them as landing notes for our lick. This makes this lick a perfect fit to play over the D7 chord. Through chord tone targetting we can play the best possible notes over any chord. As you see, this approach doesn’t need to feel too advanced, since we can use the chords we are playing over as reference. Here’s is a great exercise to get into the subject of chord tone targetting; improvise over a backing track (such as a 12 bar blues in A) using the minor pentatonic scale, but use the two most important tones of every chord to spice up your playing. Look at the escape routes that I shared in this article and you’ll find that the information in these escape routes is exactly that; the minor pentatonic scale (in box position) plus the two important tones over every chord in a 12 bar blues. You need to be aware of the exact chord in the chord progression you’re soloing over at all times. This skill takes some time to develop. If you aren’t comfortable with hearing the chords you are soloing over and knowing where in the progression you are then you must focus on developing this skill first. If you are ready to take the next step in your blues guitar soloing, download my free guide on ‘How Great Blues Guitarists Spell Out Changes’ where I take you further into the subject of playing greatly melodic blues guitar solos that are connected with the chords you are playing over: How To Solo Over Chord Changes. Do you want to break free from the barriers of your limited blues guitar soloing education? Learn About The Essential Blues Guitar Soloing Lesson.